We’re Family Fun that will Bowl you over. From 3 to 103, bowling is for all ages. Bowling is the perfect group activity and a great way to spend time socializing and team building. We have 40 bowling lanes, lots of arcade games, party rooms and a sports bar & grill. Mel’s Lone Star Lanes is a prime place for any group event, birthday party or family event. We can cater your event big or small. 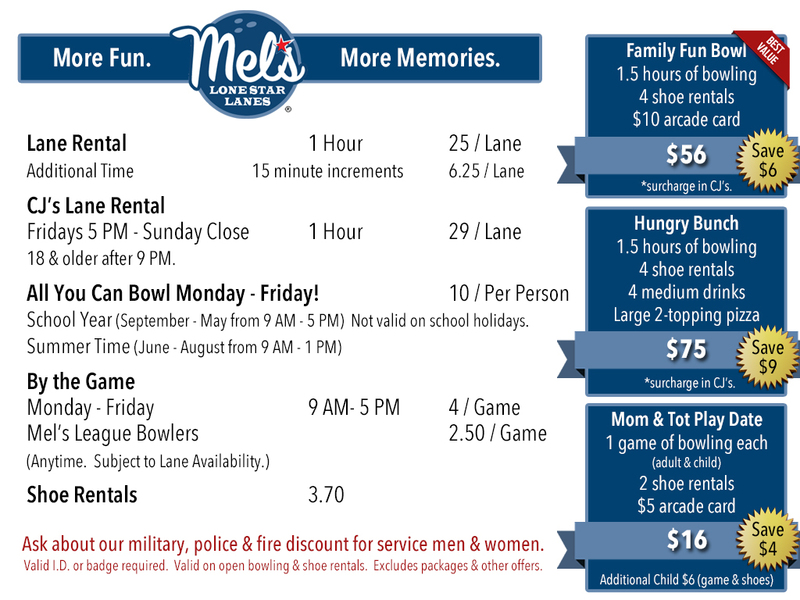 Mel’s Lone Star Lanes offers fully automated scoring, bumper bowling for children on every lane, an outstanding snack bar. League bowling options include co-ed, ladies, senior citizen, youth, PBA and company sponsored leagues. CJ’s Sports Bar – CJ’s Sports Bar is your Hometown Sports Bar. Watch every game in CJ’s Sports Bar. Now featuring a 132 inch screen TV with full surround sound and 13 high definition televisions. Enjoy one of our cold refreshing beers. CJ’s has 16 beers on tap. Serving delicious CJ’s Kitchen wings, burgers, pizza, and more! 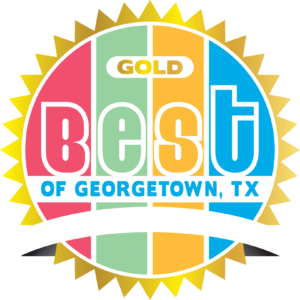 Come join us for Live Music, Texas Hold’em Poker, and Karaoke. Always call ahead for lane availability 512-930-2200. Always call ahead for lane availability. 512-930-2200. Weekday evening availability is limited. Our reservation rates are $30 / hour per lane with a 2 hour minimum. For CJ’s Sports Bar on Fridays after 5 PM – Sunday Close the reservation rate is $35 / hour per lane with a 2 hour minimum. Shoe rentals are $3.70 per person. All reservations online must be made at least 3 hours in advance. Reservations must be paid in full with the events department. Please check in 15 minutes prior on day of. Reservations are non-refundable & non-transferable. Please call the events department at 512-930-2200 or click below to book online. FOR ONLINE PURCHASE TERMS & CONDITIONS: We accept VISA, Mastercard, Discover & American Express. Lane reservations: Lane reservations require payment in full including tax. This is non-refundable and non-transferable. No outside food or drinks are allowed except birthday cake.